In this section, I cover every aspect of Classical Guitar Technique. I emphasize the Technique of Abel Carlevaro in a special manner. Several Chapters make up the Technique section and you will find them under TECHNIQUE in the Academy section of the website. When I first got involved with the guitar I was only 7 years old. At that time "playing" and the guitar were very much the same thing. It was the Sixties, though and you just could not escape Segovia's gigantic figure and all that it stood for in terms of the way "you were supposed to hold the guitar", the way "you were supposed to pluck the strings", the way "you were supposed to file your nails", the way "you were supposed to play a musical phrase". 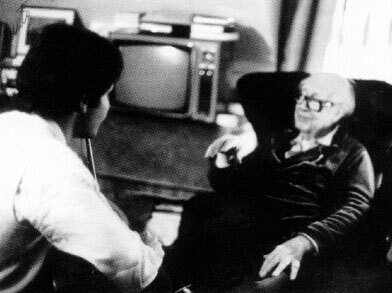 Having been a Segovia student myself, the whole process of finding my way in the guitar world was rendered even more difficult (The image below depicts my first lesson with the great Andalusian Master in his Madrid Studio-Spring 1983-). We all need models when we are giving our first steps in any walk of life. Having a guitar teacher must be a priority... having a good guitar teacher must be a top priority. It has taken me many years to realize that the best guitar teachers are those who guide us throughout our own natural, personal and unique way of playing. We must understand that when we try to copy a "guitarist model", all that we can dream of, is to be able to play as well or nearly as well as the model. I've never met any guitarist perfect enough who would say "The guitar must be played the way I play it". So, why do we keep imitating? The reason, once again, is that we have not had the good fortune of running across the sought after good teacher. It is understandable that at the beginning of our journey it is wise to walk in the footsteps of a trusted teacher but it is also true that the teacher must allow us to diverge from the marked path whenever the road ahead requires that we diverge because ultimately, there are enough differences between each guitar player so as to allow for variations or adaptations to the peculiar needs of each one of us. The differences I refer to are physical, mental and spiritual. 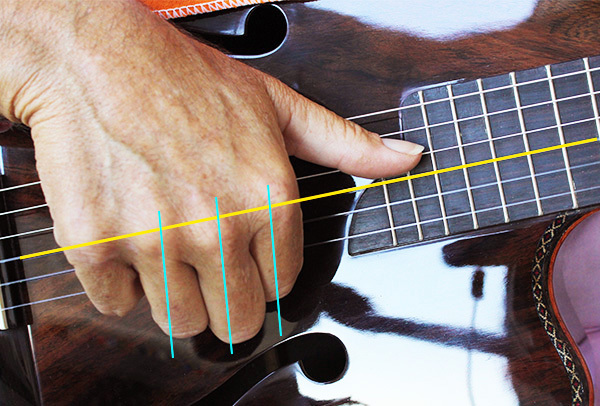 You could say that the "Left Side of the nail" (image above) approach to attacking the strings is the most used type of attack among contemporary guitar players and it certainly brings about many advantages. I use this type of approach although the angle of attack fluctuates depending on the type of musical scenario I am facing. For instance, if I am playing tremolo, the attack will gradually move towards the other extreme. The "Left Side of the Nail" approach does not always allow for the same speed as the Right Side of the Nail Approach because the tendons are slack(er). Still, the player has an overall greater control over his playing apparatus which in turn is a great advantage. In the past, a short one for the classical guitar I must add, this used to be the most used approach: Tárrega, Llobet, Segovia, Williams, Parkening, Carlevaro... all used the "Right Side of the Nails" to attack the strings. Many players still believe that you cannot play the guitar like a master unless you use this approach. This is false. It surely brings a lot of advantages into the workings of the right hand but it is also true that many disadvantages appear and they do so much sooner than later. The tightening of the tendons is clearly an advantage because tenser tendons bring the finger back to its neutral position faster thus enabling the player to play faster. 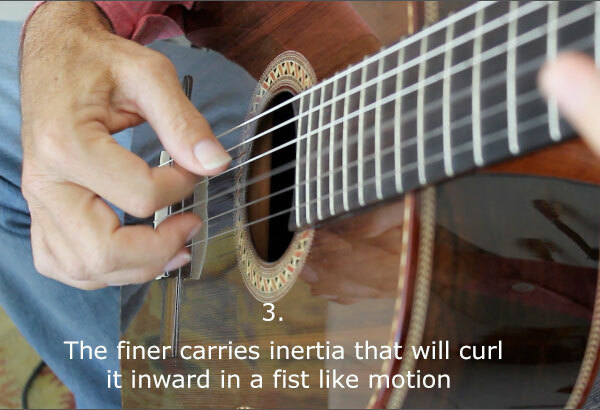 The disadvantages are that this approach strains the bones in the wrist, requires practically perfect fingernails (Read a lot more on the Fingernails of the guitar player HERE) in order for the sound to be beautiful and almost always requires the player to be all over the instrument in a contortion fashion which is very bad for the lumbar area. Typically, players with this approach have to abandon the career earlier that they would have liked to. An exception is Maestro Andres Segovia, but the reason is that he corrected his posture as the decades relentlessly passed by. Not so Parkening (who recently had to abandon a professional career due to back/hands injuries related with a poor playing posture) or Williams. You ought to consider that the "Right Side attack" depends in greet part on the quality of and type of fingernails that you have at a given time in your career. And the keywords here are : "At a Given Time in your Career". My career with the guitar has covered well over 4 decades and I have seen my fingernails change very dramatically in all these years. Their shape, thickness, curvature changed to the point that keeping the angle of attack unaltered would have meant to abandon the career. Typically what many players do is to start using synthetic nails of different types so as to be able to keep their technique intact. This in turn is the beginning of a different set of problems that can create havoc in a guitar player's life. What ends up being the most sane approach is to change the angle of attack and that requires great determination, intelligence and patience on part of the guitar player. We all have our musical taste and preferences. I may love Segovia's playing but yes, I wish he didn't make so much noise with his left hand... or Parkening's but I wish he... or you name it. I often think that the secret to all of these masters' playing is: do not take the guitar so "seriously"... yet, be a professional in your way of doing it. After all, it is not the Holy Bible we are dealing with. These Masters' voice is not the voice of God but their own. This is the greatest teaching: To find our own voice with the help of a teacher. I have been living for over 4 decades in a country -Paraguay- where 90 per cent of the guitar players are self taught folk players. I am constantly amazed at seeing how these players find their way around the most bizarre musical phrases. I sometimes think that they represent -without wanting to- a part of ourselves that has been partially lost or neglected. We must come to realize that a big part of our own learning must consist in a discovery, a personal discovery. In these pages you will read about concepts like "creative technique" and "making your own exercises". It is thanks to these concepts that I was able to keep my passion for the classical guitar alive throughout all these decades and I'm sure that had it not been for them I would not have persevered. In the Video above, Maestro Renato Bellucci Introduces Guitar Technique: A Creative Process: "Make your Own Exercise". Maestro Bellucci uses the opening phrase of his transcription of Ennio Morricone's "Gabriel's Oboe" to carry his point across. When I think of guitar technique, I think not only of the mechanical way to achieve a given result but to a much broader concept. Remember that our technique is constantly changing or, to use a more modern word, upgrading. If we look at the traditional guitar methods, we will see how each one of them approaches technique in a static, distant, non-musical, self standing way. What is worse is that we do not even know what pieces from the guitar repertoire these exercises best apply to. As a matter of fact, most of these guitar methods usually have a series of incredibly boring exercises attached to them as if the only way to acquire the given skill were to "swallow" the bitter pill. The times are constantly changing and for a contemporary guitarist to keep up to date with his every day life -which will most surely be shared by a "regular job"- it would be ridiculous to expect that the few hours we can dedicate to playing were dedicated to these ugly-sounding, anti-musical exercises. Remember that there is no such thing as a beginner, advanced or intermediate repertoire but only a "I like it... I don't like it repertoire". I have come to realize that the best motivator to learn a piece is not to focus on how hard or long it is but strive on how much we love the piece and how hard we dream to be able to play it. I will show you how by teaching and learning many pieces online with you and showing you the process that I have been using for many decades (The Masterclass section of mangore.com takes you through the learning process of well over 65 guitar classics and many original transcriptions that I arranged and fingered for the classical guitar). The most important thing for a musician must be the quality of his sound. I will never get tired of repeating this because most too often, what seems to be obvious often falls between the cracks and it is amazing how many players neglect this basic and essential aspect of guitar playing and guitar technique in general. Below, I show how to move the finger from the main knuckle in the right hand in order to produce a full, round, bell-like sound. You may consider this the basic guitar sound. It is without a doubt the sound you will be using most of the time and you ought to build your right hand technique around it. The exact angle at which you will "attack" the strings, will really depend on your own peculiar and unique physical built. The shape and consistency of your fingernails and your body size. Use the video as a guide but remember that your main mission as a guitarist will be to find your base sound. Below I show the 4 stages that produce the perfect guitar sound. It is often referred to as the attack to the string because it is done swiftly and very subtly. It is necessary to break down video footage in frames like I did below to see what really happens when a good guitar sound is produced. 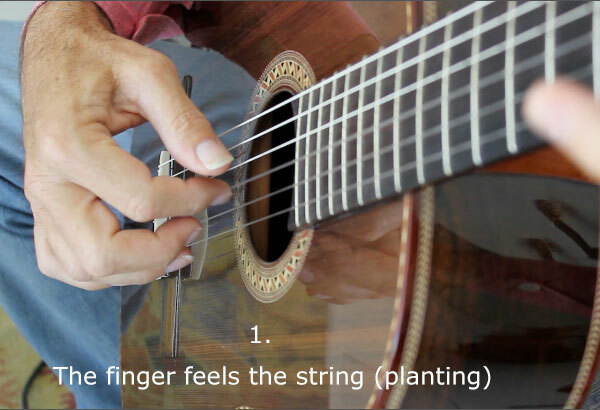 If you squeeze the tip of the fingers into the strings and then look at the groove that the string leaves behind, you will see the place where PLANTING happens. Planting could be translated as feeling. What you do is feel the string with the tip of your fingers a fraction of a second before the nail makes contact with the string. If you master the technique of planting, you will be building your right hand technique on the most solid and reliable foundation possible. Guaranteed! The tip of the finger makes contact with the string in the place where the flesh is exposed and just a fraction of an inch from the fingernail. Planting is not exclusive to the guitar technique but it is found in every instrument where the fingers and even the bow in the case of the violin is involved in the production of sound. Piano players are well known to apply the planting technique. What planting does is allow the performer to control the quality of his sound and gives a lot of control over the intensity and color of your sound. It also ensures the proper work of the right hand fingers. At first you will have to implement the planting technique very slowly and feeling every move until it becomes second nature. This technique alone will change your playing for the better exponentially. Incorporate planting before each note whether it is a scale, arpeggio or chord scenario. At first, you will notice that the planting creates a staccato in the sound. That is normal. As you become proficient with the technique, your planting will be so fast that the planting and playing will be incorporated in a single movement of the finger and the staccato will not be perceivable. The i finger makes contact with the string (planting). As soon as the right hand finger feels the string with the flesh on the tip, it pushes inward bending the string like the string on a bow when an arrow is tensed before being launched. The amount of bending will determine the intensity (volume) of the sound we produce. The attack is the one element of your right hand plucking that is id direct relation with the volume and the color of your sound. Yes, musicians refer to the gradients of sound as "color" just like painters do. Musicians see tonalities as different shades of musical colors. The signal is sent for the i finger to close inward, in a fist like motion. The plucking finger carries inertia and you will let it follow its natural movement inward which will resemble an attempt to close the finger in a fist like manner, coming closer and closer to the palm of the hand. This is really a fist like motion and the player ought to offer no resistance to the travel inward of the finger and must allow the extensor muscles in the forearm to bring the finger back to its relaxed position after the attack is through. The finger comes close to the palm of the hand. 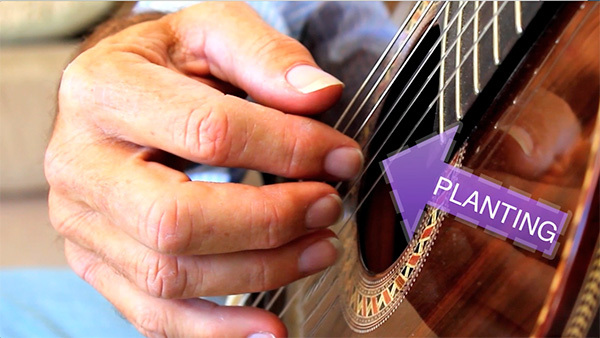 The finger receives no more impulse and the player relaxes the finger completely so as for the finger to return to its natural curved position. This works very much like those automatic doors that only need to be pushed in to open but will close automatically behind you once you passed through it. Tension is released so as for the i finger to return to its relaxed position. Below you can see the 4 stages mounted in the video clip played in slow motion over and over again. 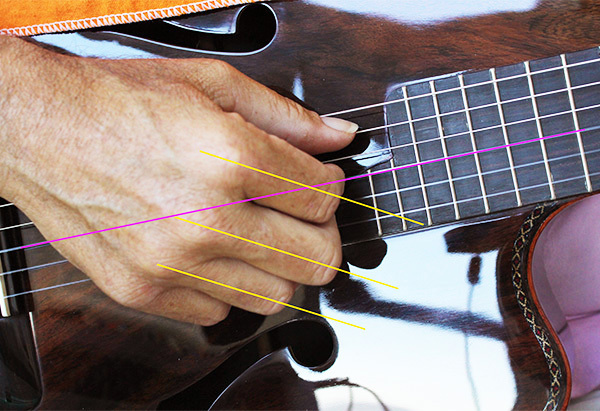 Summing it all up, the sequence shows how the a finger makes contact with the string (1), pressure is applied and the string is held between the flesh and the fingernail (planting). The player feels the string with the flesh. (2)The right amount of pressure is applied until the desired volume is achieved before the string is released, and (3) the finger can finally return to its natural relaxed position. The angle at which this sequence is performed, will decide the color tone of your sound. In developing our technique we must never lose sight of this foremost element of performance: SOUND. I can affirm that if we concentrate on sound, we will develop a technique which will be in accordance with this key element. 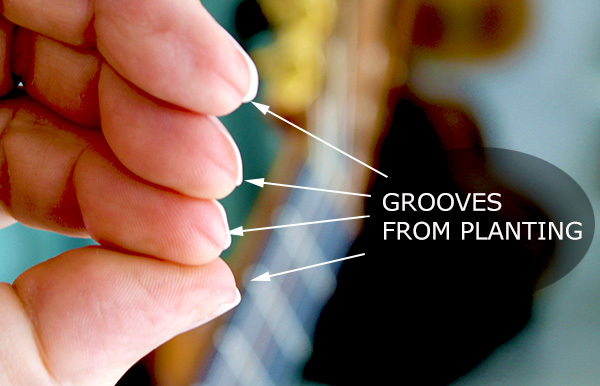 Keep in mind that the classical guitar uniqueness lays in the fact that sound quality and production is physically related to our fingers and fingernails. We deal with no keys, bows or mechanisms but with our very own body for the creation of our sound. Marvelous! This also means that our technique will naturally be re-created with every new piece we learn. There is no such thing as The Segovia Technique, The Carlevaro Technique, Tárrega or Llobet Technique which will be good enough for us. We must come to say that we use "our technique". 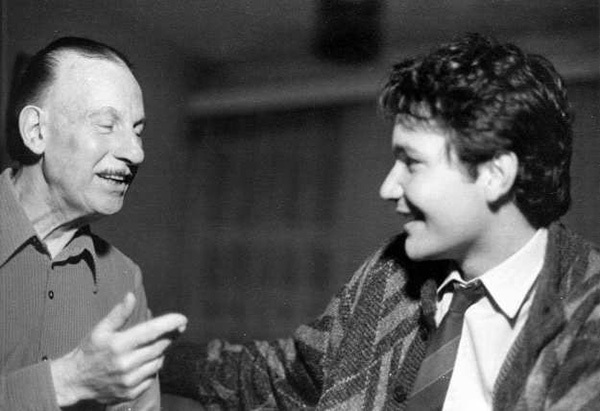 It is always wise to see what the great maestros have to say about any particular aspect of sound production, though, we must have the personality and patience to be able to read between the lines and re-examine each one of these aspects to see which one and how they best apply to us. At the same time believe that you might create something new altogether. I remember a master class with Elliot Fisk where he "proudly" showed his left-hand little finger. It is as long as his "a" (ring) finger! It doesn't take a genius to realize that certain musical passages which are naturally fingered by Fisk to work with his hands, simply will not work for us. Take my word for it. We will have to think musically and ask ourselves: What do I have to do with my hands to achieve this particular result?